Decorative home lighting for log and timber homes is a little tricky because wood walls and ceilings tend to absorb light and make rooms darker. There is a good reason that log homes seem darker than other homes. Log walls and wood ceilings actually absorb up to 50% of the light in the room. The darker the walls, the greater the absorption. But,never fear. This is not a lost cause. With a little ingenuity, you can use lighting to create drama, intimacy or coziness in each of your rooms—depending on the effect that you would like. 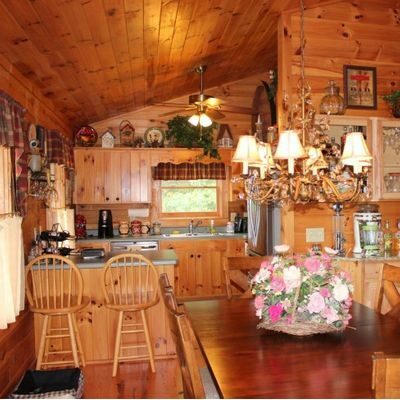 How Do You Make a Log Home Brighter? To avoid feeling like you are in a cave, you can add several sources of light in each room. It’s important that you don’t rely on just one light source in a room. A single central overhead light in a room produces glare. You’ll need a reasonable amount of general or ambient lighting, and a few other sources of light, for tasks like reading a book or preparing meals in the kitchen. Track Lighting – Use track lighting to show off your pretty walls and your exposed beams. While you can get track lighting in black or white, I prefer bronze, which tends to blend into the walls better. Fluorescent lighting – in the kitchen. Use lights under the cabinets to help you prepare meals. Many people also like a large fluorescent light overhead in the kitchen. But don’t depend on that for all your lighting. You’ll need to have task lighting over your sink, under the cabinets, over the stove and anywhere you will be performing tasks. This is for safety, as much as for comfort. Vary the heights – of lighting in your home. This adds interest and help to illuminate more areas in your room. Sconces give you light at eye level, breaking up tall walls and adding interest. The indirect lighting in this room draws your attention to the wood walls and the stone fireplace. It shows off the height of the cathedral ceiling and provides ambience. Use indirect lighting – to provide ambient lighting and add light to darker walls. Task lighting – not just for the kitchen. Table lamps or floor lamps, placed beside chairs, provide areas for reading or knitting. Overhead lighting can provide lighting for a game table or pool table. Highlight artwork – Using small lights to highlight special paintings or prints draws your eye to the wall, and it also add interest and some light to your room. Chandeliers – Use chandeliers in special areas, like the entry to your home or over the dining room table. They provide interest and many can be dimmed to provide ambience. Pendant lights – Use these lamps where you won’t be bumping into them, with your head. Over an island or the stove in the kitchen are two possibilities. Decorative pendant lights serve as task lights, illuminating a small area underneath them. Using decorative home lighting in a log home is not difficult, but you will have to put your thinking cap on and get a little creative. And, in doing so, you will find ways to really show off the beauty of the wood, in your log or timber frame home. You may be interested in this article on Log Home Lighting. Choosing rustic ceiling lighting is an important part of outfitting your cabin, log home or lodge. 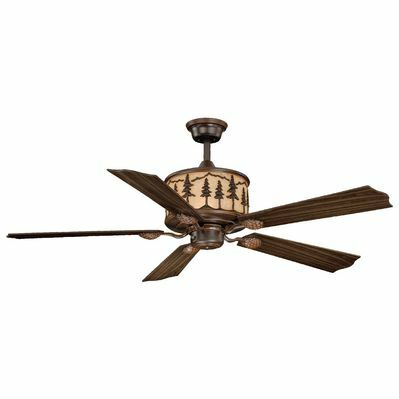 It seems so simple, but picking the best rustic ceiling fans and lighting for your home can make a huge difference in the ambience of your cabin or lodge. Ceiling lighting is most often used in bathrooms, kitchens, hall areas and bedrooms. A deer antler chandelier can be dramatic and awe inspiring, and rustic antler chandeliers are the perfect complement for an upscale hunting lodge or a cabin in the woods. If you want a “Wow!” for your common area, consider a deer antler chandelier. Deer antler chandeliers are made from real deer antlers that have been shed naturally by animals in the fall. No animal is hurt or killed to use their antlers. Antlers are a renewable and sustainable resource. How did antlers get into lights? The use of deer antlers goes back thousands of years. Ancient Chinese physicians used ground antlers in their tonics and medicines for healing. Closer to home, in the Americas, native Americans used antlers to make knife handles, spear points, scrapers for processing animal hides, combs and hairpins. On the European continent, medieval Europeans started making antler candle holders. From there, the transition was easy. Standing deer antler chandelier candle holders soon became hanging candle holders or candelabras. These were the forerunner of our modern antler chandeliers. European castles in Great Britain and Germany proudly used antler chandeliers in their grand rooms. The chandeliers were dramatic and elegant—fit for a king! 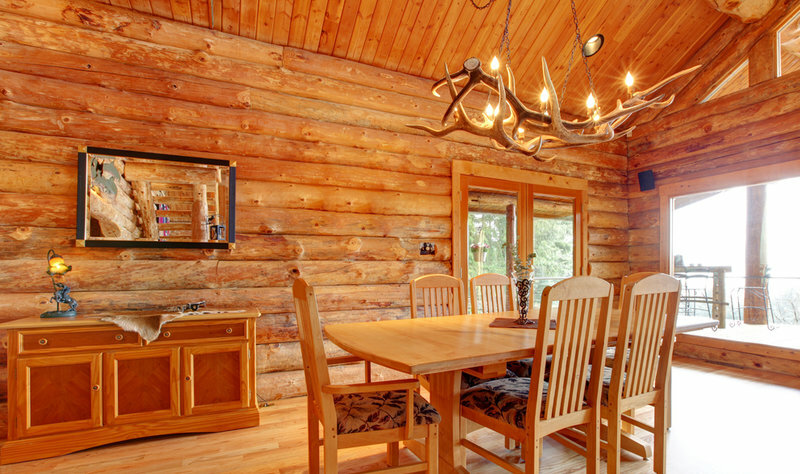 Today, you often see a deer antler chandelier or an elk or moose chandelier featured in rustic resorts, in high end rustic restaurants, in timber frame lodges and, of course, in large log hunting cabins. If you are thinking about using a large chandelier in your new home, here’s a tip to make things easier for you. 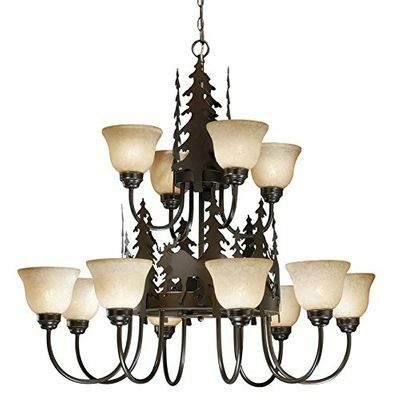 Lighting fixtures like chandeliers should be purchased before your home is built, especially if you are building a log or timber frame home.. Installation becomes much more difficult after the home has been finished. What’s the difference between mule deer and whitetail deer? At first glance, these two deer look pretty similar. In fact, many new hunters have difficulty telling them apart from a distance. The Deer’s Ears – Mule deer were named because of their large mule-like ears. Mule deer’s ears are larger than whitetail deer’s ears. In addition, mule deer tend to hold their ears at an angle, while whitetail deer usually hold their ears more erect, or straight up. Deer Tails – The mule deer has a thin white tail with a black tip. The white-tailed deer has a brown tail with a white underside. It uses its tail to warn other deer of impending danger. When a deer senses danger, she puts her tail up. Deer behind her see the white underside of her tail and react accordingly. Fur Color – Mule deer tend to be grayish brown, while white tail deer tend to be reddish brown in the summer and turn to grayish brown in the winter. Size of Deer – Both deer can range from 80 pounds to 400 pounds, with mule deer tending to be a bit larger. Here’s another interesting fact. Whitetail deer tend to be larger in New England and smaller as you go south. Deer Antlers – Both mule deer and whitetail deer shed their antlers every year, after the rut or breeding season. Mule deer have antlers that fork. Their antlers have a main beam that splits into 2 directions. Whitetail deer have antlers with one main beam, from which all other tines branch out. 2nd Ave Design pendants are the perfect choice for luxury residential settings and for light commercial projects like restaurants, golf courses, casinos, country clubs and senior living projects. 2nd Ave Design rustic pendant lights are made in the U.S., and, in essence, you end up with a customized work of art. You choose the design, the finish, the shades and the crystal package for each item that you order. If you can envision a rustic pendant to work in your setting, you can have 2nd Ave make it for you! 2nd Ave Design has been in business for over 25 years. Based in Yorkville, NY, the company manufactures pendant lights, wall sconces, and lanterns, in addition to some other specialty items like chandeliers. The company’s reputation has been built on quality and customization. They specialize in both interior and exterior lighting fixtures. 2nd Ave Design manufactures wrought iron lighting fixtures like chandeliers, wall sconces, pendant lights and lanterns. They are known for their iron and brass lanterns. In theory, no two log cabin light fixtures that you purchase, would be the same. You choose the design, the finish and the “glass”, from a very inclusive list of possibilities. When you purchase a rustic hanging fixture from 2nd Ave Design, it truly becomes your design. What Makes 2nd Ave Design Different? 2nd Ave Lighting has a team of specialty employees, who create their lighting fixtures, just for you. Their in-house designers create classic designs that are timeless and will not go out of style—in your lifetime or mine! 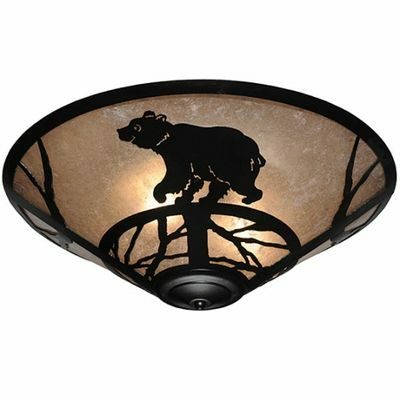 Their staff also includes specialty metal workers, blacksmiths, people who hand finish each piece, and quality control engineers who inspect and approve each lodge lighting fixture, each step of the way. All products meet the standards set by Underwriters Laboratory, meaning that you can be assured of top quality and safety. Rustic lamp shades come in various materials like metal, leather and parchment. You can even get lamp shades with deer, moose, bears, elk, trout or painted pine cones on them. Of course the most important thing to consider is whether a lamp or light fixture will look good in your home and provide light where you need it. But, don’t forget that a pretty lamp shade has its own appeal and it is the finishing touch for a beautiful rustic lamp. The rub is that, often rustic lamp shades only come with a lamp and cannot be purchased separately. 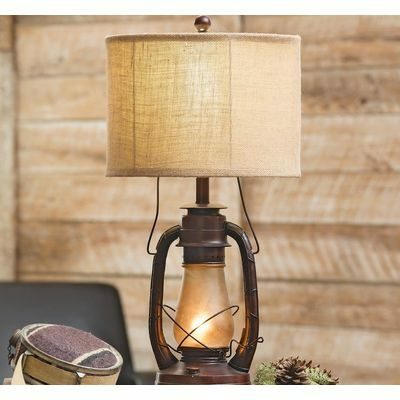 Of course there are different types of lamp shades for rustic cabins and lodges. Some have a wildlife theme while others tend to be more western or just simple and rustic. 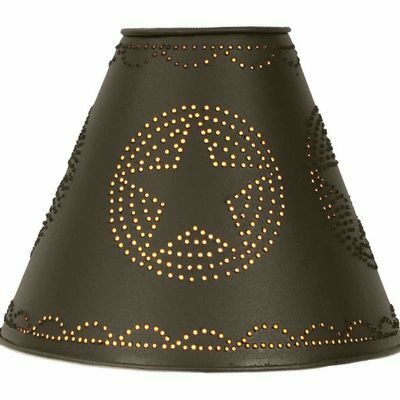 Choosing a lamp shade type will depend on your country style or décor and the theme that you have chosen. Parchment lamp shades – These are probably the most common kind of country lamp shades that you will see. You can get plain parchment lamp shades, lamp shades laced with rawhide lacing and parchment lamp shade with hand painted designs. Parchment lamp shades are usually a neutral color. Mica lamp shades – Mica lamp shades shine with elegance. They are usually hand made and they have an interesting natural texture. You can use mica shades with both western and rustic décor. Metal lamp shades – Remember the old pie cupboards with the punched tin decorations (that let air circulate in the cupboard)? 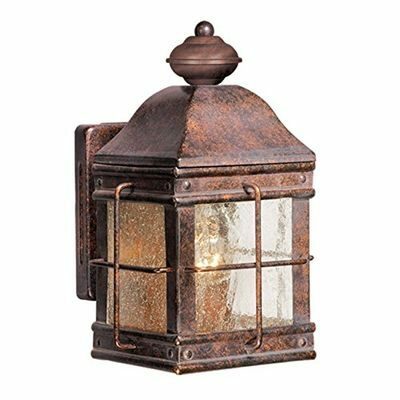 Metal lamp shades have an antique look and are also rustic lamp shades. They bring a unique sparkle to a room, with a touch of magic. You can get metal lamp shades in different metals: copper, tin and painted black metal. Leather or faux leather lamp shades – There are lamp shades that are actually made from thin leather. And quite a few are laced with rawhide lacing. Leather lamp shades are especially appropriate if you have chosen a western décor for your log or timber home. The colors and textures in leather lamp shades are natural and they are rustic but also very classy! 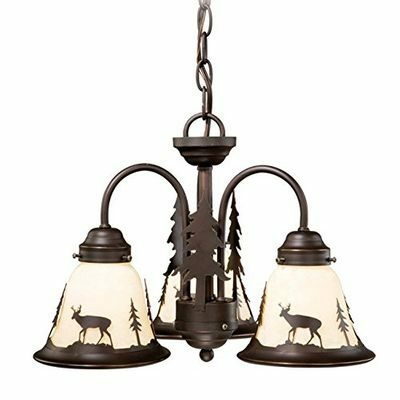 Hand painted lamp shades – Some of the cutest rustic or country lamp shades are hand painted with themes like deer, pine cones, trees, horses or moose. If you have a specific theme for your log or timber home, you can probably find lamp shades to match your them. And many of them are hand painted by famous artists! Choosing the perfect lamp or light fixture for your home is only half the battle. You need to make sure that the lamp shades that you choose are complementary to your lamps and work with your theme. How Do I Choose Products for Everything Log Homes? When you shop for lighting products, you want to know that you are making a smart purchase of products that will look good, and last for years to come. Rustic – because Everything Log Homes is about rustic log and timber homes, I look for rustic designs. Things I Like – I know this is not scientific, but I do choose things that I personally like. It’s pretty hard to write a description about a product that you don’t like. I like to keep things fun! Reputation of the Manufacturer – This is important to me because I want my purchases to be durable and last for many years. Rustic Décor Product Reviews – I look at many sites online to see what people say about a specific product that they purchased. This is pretty subjective, but I do try to get a good sense of which products are good or bad. And I want to make sure that I recommend only the products that you will be happy to own. Finally, I want you to know that I have not received any money from any manufacturer or retailer to review their products. And I have not received any free products from anyone, either. I choose the products to review myself, do the research myself, and I write reviews of products that I feel are the best choices available. No one else has influenced my decisions. And I have not received any free products or money for my reviews. I hope you’ll enjoy viewing my selections.